There are loads of browser games and then specifically clicker games. Some of them are also getting downloadable and can be found on Steam. One of them is Plantera, where you can build and decorate your own garden while keeping some animals as well. If you like beautiful, vibrant colors and you want to start farming, this game is something to consider. Plantera doesn’t really have a story as you’re just thrown in. When you start the game for the first time, you see a nice farm or garden with blushing trees and small bushes. Here and there are some animals like a sheep and a chicken. The butterflies are fluttering about and everything is so peaceful and tranquil. This is just a dream though, as your worker wakes up when you want to begin gardening. You’re broke and the only thing you have is your blue friend. Together, you can start building your dream. 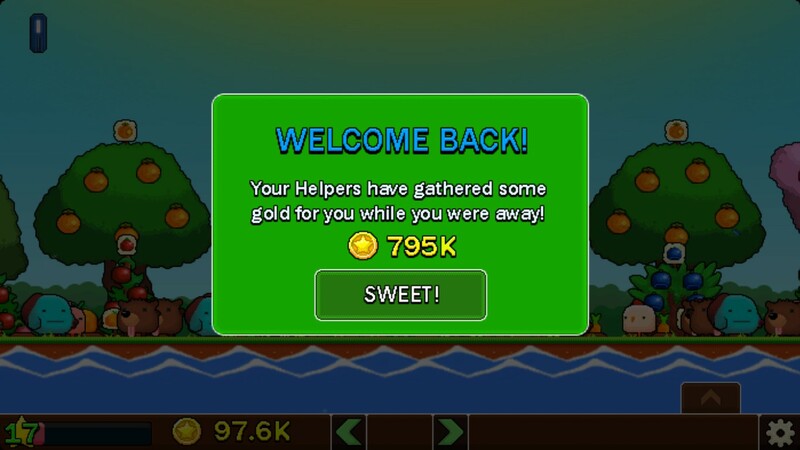 Although this is a clicker game, it would have been nice if there was a bit of story-related content. Sure, it is fun and nice at the beginning but after a while you’ll start craving for more. When playing this game, you’re bound to get happy within five minutes. Plantera’s graphics just splatter off your screen and makes your day that much more colorful. No bland or shady hues but vibrant and light colors. Don’t expect the latest graphics, but more of a comical style with nicely finished elements. Each image really fits the overall style of the game, making it quite special to look at. You will certainly recognise each type of fruit and vegetable, together with the different types of animals. 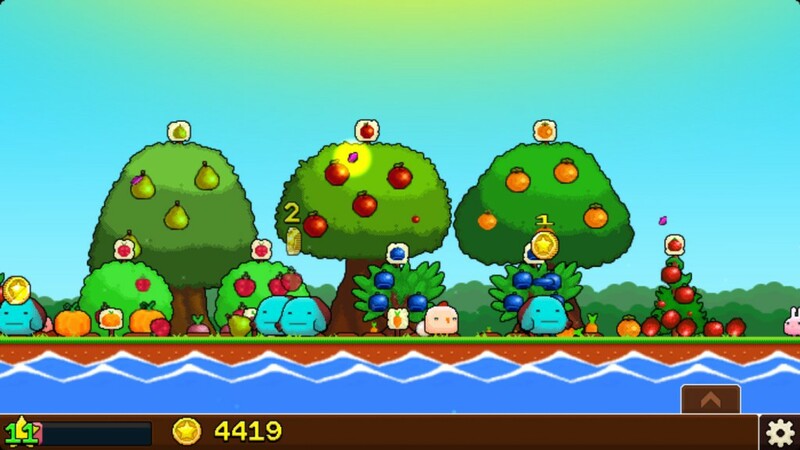 If you like cute, puffy creatures that will meld you then you’re sure to love this game. Bluntly said, the same track will loop over and over again and might get on your nerves soon. The current tune isn’t bad and fits the game but it would have been nice if the music was a bit more diverse. After a while, you’re just going to mute the sound, but you’ll miss out on the sound effects. These effects aren’t that extensive as well, but aren’t that bad either. Clicking on your items will have a nice ‘pling’ sound, while tapping on enemies has a more flat tune. If this isn’t enough, your animals will make some background noise as well, giving it a pleasant busy vibe. Plantera is a simple clicker game that will take you to a nice and tranquil farm life. You start the game with no money and one worker, but you can gain money by tapping the butterflies. 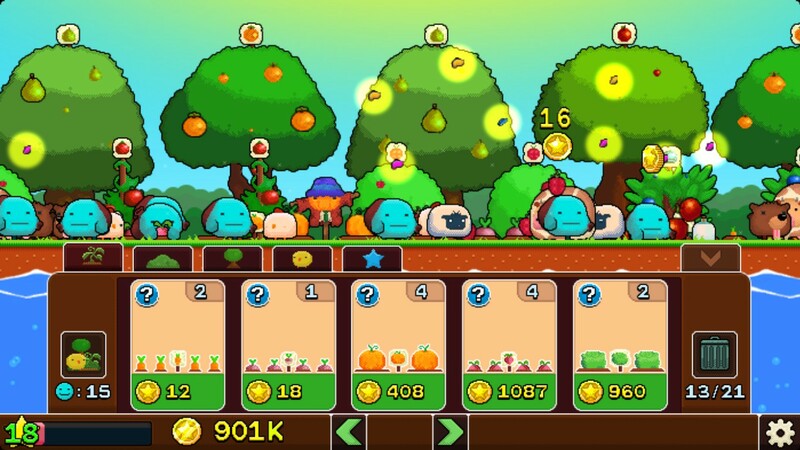 With this hard-earned dough, you can buy your first plant and with this profit, you can buy even more fruit and vegetables. To speed things up, you can click on ripe products so that they fall on the ground, ready to be picked up. Your blue worker will help you with that, although you can give him a hand. This isn’t necessary though, you can just start the game and let everything go with the flow. After a while, you will level up. Increasing your level is very important in the beginning, as you will gain access to new elements for your farm. The first animal you will unlock is a chicken, which will give you some nice eggs. Buying an animal has some other effects as well, as you will get visited by some unwanted guests. These can be chased away by clicking on them, or you can buy a dog to shoo them away. Next to foxes, you also have birds that try and steal some of your veggies while a mole will pop up as well at certain times. If you hear a weird and random noise whilst seeing a weird knight running on your screen, no need to fret. He is a gentle soul that wants to help you with chasing away the uninvited party poopers. Unlocking more and more items to plant or animals to let loose, you’ll notice soon enough that your space will get crowded. At least you can expand your beautiful garden, giving you more room and inviting a new blue worker to help. These helpful friends also keep on gathering items when you shut down the game. At the beginning, this is just for a short period but you can buy extra time. Something else quite special is possibility to buy fertilizer. This means that the value of each item will double and this effect stacks. The more money you spend on this brown goodie, the more dough you’ll get. This is a fun addition, but it is a shame that you cannot use all that money for a bigger purpose (maybe something more story-driven?). If you have some free time or you want to dive into a colorful world with squishy animals and blushing fruit and veggies, then Plantera will be the game you seek. Although the sound might get repetitive quite fast, the graphics make up for it. It is a shame that there isn’t anything more story-related in the game but you’ll have fun for a while though.